We've just gotten back from a three-day weekend in Bluff Creek. Look to upcoming blogs for images and commentary from that trip. No obvious Bigfoot activity was noticed, though the magic of the place was palpable. We saw three bears, one of which was spotted with Gen-3 night vision binoculars as it entered the edge of our camp area. More later! 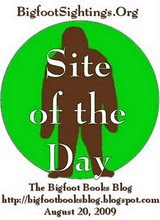 Meanwhile, the Bigfoot Forums upheaval continues to occupy our time and attention. See below for an update on that and the upcoming BFF-V.2.0. Emails and Comments have been flooding in--how long before we are crucified? Find below our Editorial, a Poem, and a hodgepodge of Bigfooty fun. Some wish to prove what they have seen, and so validate themselves. Some wish to prove what they believe, one side or the other, and so justify themselves. It seems to us it should really be about discovering and seeing reality. It should not be a personal issue. 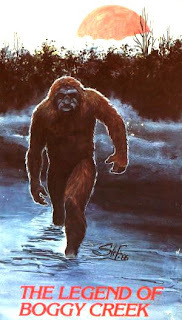 Either the Sasquatch exist or they do not; and either way they do not give a hoot whether we believe in them or not. What concerns us about this little argument over Bigfoot is how it is emblematic of larger social issues. It is a microcosm of how we treat each other and the other creatures. It reveals our general lack of respect, whether it is Bigfoot or Star Trek we are discussing. Or, it reveals respect for and openness to reality and other living beings. The ones getting the least respect are the Wild Ones; and they watch from the shadows at the edge of our civilization as we slowly destroy the world upon which all the living things depend. We've said this many times before, and we keep having to say it: Be the kind of person a Sasquatch would want to know, think like a Squatch. How else can we ever hope to know, find, understand, or prove them? One thing we found in Bluff Creek this weekend is that life goes on outside, and has so done for ages, heedless of our human bickering and conflict. Outside, out there, it is a beautiful universe, and all possibilities exist. 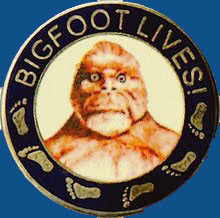 This, to us, is the spirit and meaning of Bigfoot. All the rest is just plain human neurosis. 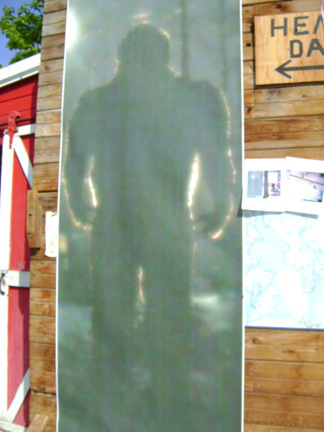 Images: To upper right a life-sized BF poster at the Yakima Bigfoot Round-Up. Below, in Bluff Creek, near Louse Camp, and Daniel Perez speaking at the 40th Anniversary PGF Celebration in Willow Creek. Taken by Steven Streufert, 2007-2010. 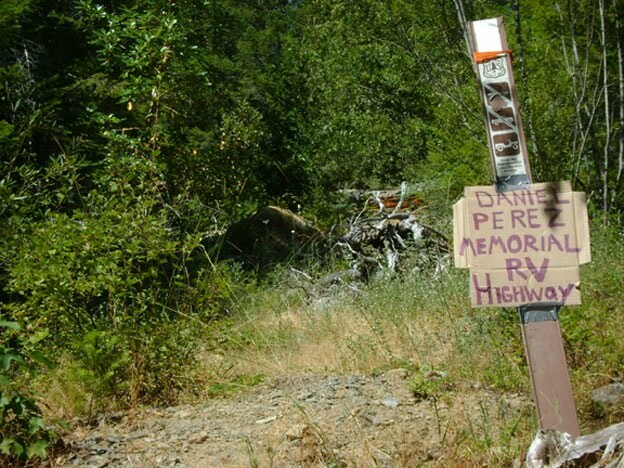 The Daniel Perez Memorial RV Highway? Well, this is the formerly treacherous, and now decidedly closed and defunct upper road going northwest out of Louse Camp. It is famous (well, this road, or the one just up or the one just down from it are good candidates, though we haven't been able to get absolute clarification from Mr. Perez) for being the road that killed this Bigfoot researcher's recreational vehicle in an accident that nearly claimed his life and could have burned the whole Bluff Creek basin in 1998. Only some trees on the cliff/hillside saved him from the surely deadly plummet that could have been. The whole thing burned up, taking many valuable Bigfoot records, photos and his computer; but the fire kept Perez warm during the chilly night he had to spend without warm clothes or a sleeping bag. 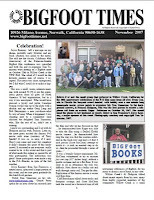 You can read about this event if you get the back issues and index of the BIGFOOT TIMES, the "last published and mailed out newsletter on Bigfoot in the world." Clue: October 1998 BFT, available from Daniel on his website, linked above, for a well-worth-it $1.50 per issue. TWO GREAT FILMS, and a Bigfooty Celebration! A Sasquatch-centered evening featuring showings of THE LEGEND OF BOGGY CREEK and THE SNOW CREATURE, along with Bigfoot discussion, PGF film clips, BF knick-knack raffles, displays and maybe a talk on the subject. Somehow we got a special sponsorship role in this event, but all we recall doing was providing film and music clips to the organizer, Mike Sargent. Now we're supposed to give a talk, according to Bob Doran of the North Coast Journal paper? Funny how reality goes on in advance of our awareness of it.... Will we speak? Maybe we'll just wear camouflage and bring night vision goggles. Coming up! Wednesday, September 1st, 2010, from 6:00 to 10:00 p.m., 1036 G St, Arcata, Humboldt County, California. All ages welcome. Admission is FREE with a minimum $5.00 purchase, which is easy to accomplish, thanks to their fine selection of beers at the bar (Two IPAs!) and good pub food. This one is going to rock! Hosted by the boys of Missing Link Records in Arcata! There will be storytelling, venders and more with a special sponsoring by Steven Streufert of the Bigfoot Blog (and books)! The comments are interesting, so look down at the bottom. 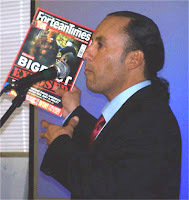 Apparently it is "slander" to speak out against slanderous behavior on a public Bigfoot forum? Go figure, folks. On the Version 2.0 Bigfoot Forums' new Facebook page there were a couple of updates of interest lately. First, the site is going to be hosted by a hopefully objective new party. 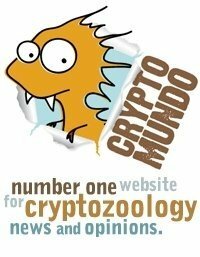 "Since we discussed it on The Bigfoot Show, the new BFF website will be hosted and maintained by the Centre for Fortean Zoology - an organisation that has no alliance with any 'bigfoot' organisation. CFZ has been in existence for eighteen years and is the largest Cryptozoological organisation in the world and takes no official stance on bigfoot." "If you have existing grudges with other members or the old administration, leave them at the door please, this is going to be a fresh start for BFF, and we hope, for the entire bigfoot community." All of this sounds pretty promising. The new site could be up and starting to run any day now. The archives will be preserved, apparently. Let's hope for the best. 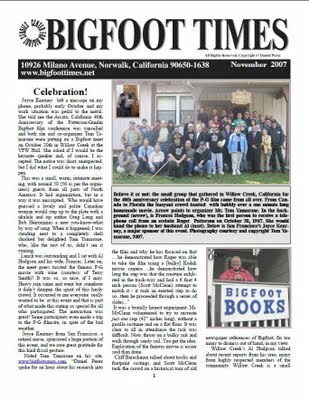 Perhaps the REAL value of the BFF at this point--and we admit this is what we used it most for--is the record it presents of the history of the Bigfooting Community? It is incredibly useful in this regard: to go back and look at all the characters and controversies over the years, and how things played out or how certain "evidence" flopped. 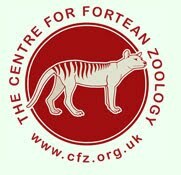 Visit the CFZ/CENTRE FOR FORTEAN ZOOLOGY to see what they are all about. 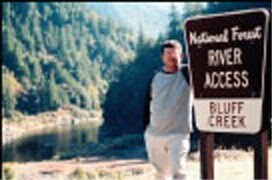 Former BFF subcomandante RedWolf has been posting bizarre conspiracy theories regarding what happened at a recent Northern California camping trip that included a number of AIBR and BFRO members, as well as BFF founder Brian Brown and Jerry Riedel. Well, we checked it out with our sources, all of them wishing to remain anonymous, and they all say NOTHING UNUSUAL happened at that campout. Whoever thinks this was some kind of "summit meeting" of the "Elite" of Bigfooting are really fooling themselves, by all appearances. The BFF came up in camp a few times, and was discussed mainly in regard to the problem of the moderators and administrators getting caught up in the discussions and arguments rather than helping moderate them. No specific topics were "argued about," no grand conspiracies plotted. The concern: Was the BFF still serving its intended purpose, or had it become lost? Changes were going to be made, the word had it, and Brian Brown told us; but that was about it. Apparently, Brian made his decision as he made the long, thoughtful drive back across the country to Minnesota.Brian Brown's mobile FaceBook updates along the way back home from the campout contain some clues. Anyway, to sum up: RedWolf's posts on BFF and JREF are NOT how it went down; and Bipto's are CORRECT. No need for Conspiracy Theory--there wasn't even a Lone Gunman in this one. Brian Brown "is tired of the bigfoot community continually eating its own young." "I couldn't agree more. We spend so much time fixating in the things the separate us and drive us apart instead of the (admittedly fewer) things that bind us together. Life's too short for that." It's pretty clear what happened, isn't it? Just an ordinary annual camping trip among friends. 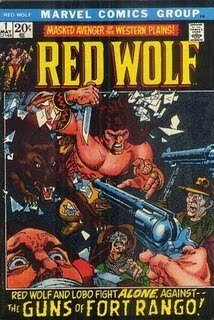 * Read the REDWOLF POST HERE. Currently at 9 pages, read back and forth in the JREF FORUMS thread, THE IMPLOSION OF THE BFF, this being the page where RedWolf starts the false theorizing (for page one go HERE). * Watch for the posts of KITAKAZE for some real good conspiracy theory including his idea of the sinister "Gimlin Guard." Ouch! Apparently Kitakaze thinks HE brought down the BFF with the tremendous power of his P-G Film debunking. Yep Kit, we just could not handle it! Ha ha. 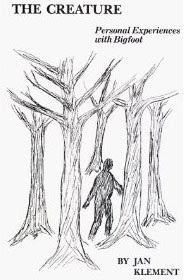 * Read the SEARCH FOR BIGFOOT FORUM thread THE BFF: A EULOGY for more (and to see what a sane discussion forum looks like). * Read the paralyzed and frozen old BIGFOOT FORUMS HERE. A POEM FROM M.K. DAVIS! In response to our last blog which featured a poem we wrote, M.K. Davis, out of the blue, sent us a song-poem he wrote a few years back. 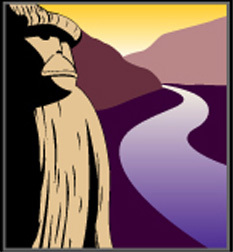 It is in the tradition of the old-time bawdy song, but with a Bigfoot theme. 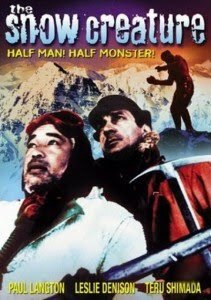 It seemed even more apt for us, as we'd just a couple of weeks ago finished reading the book in question, THE CREATURE . "Then it is true what they say about the poet, especially in this business. A poet, that doesn't know it, but the feet show it...they're longfellows. Hey, I tried my hand at writing a bigfoot song once. I wrote a little ditty called "Party at Jan Klements". It's good for a chuckle. It's in the attachment. BTW, you should name your keyboard "excaliber." You do a lot of slicing and dicing with it." -- M.K. When my time was a lot better spent. Now I'm sleepin' in a doggone tent. Did you see which way that sasquatch went? There's a party at Jan Klement's. Now it all began to make sense. I just wanted to see what it meant? There's a party at Jan Klements. and everybody's seein' the beast. He said " tis the breeding season". When they party at Jan Klement's. Bigfoot: Otherworldly, and of the Earth. Since we're reading his book, IMPOSSIBLE VISITS , we thought we'd post this short but interesting statement from the book's author. Thanks to Chris Kummer of Sasquat.com for the tip! Me no like dogs. Me see dog, me take and tear in half. 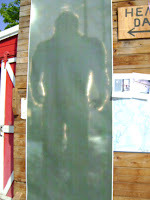 You read about it in Bigfoot book, it true, hu-man. Ask book guy, he know. Dog chase me, it die. Or cower under porch and whimper. Like "Dogs" on Big Foot Forum place. Me laugh and bust gut hernia. Me hear silly little "bark bark" and me squish. That what some hu-man sound like too when Bigfoot actually listen. Problem is dog not taste good. Hu-man not neither. Else me eat more all the time, and they too busy run away to argue on dumb internet place. I think I seen a photo of that redwolf once. That is one ugly dude.